Whether you are a native Spanish speaker or a beginner, Tidewater Community College Libraries will soon have new books to help. Blicher, Dawn Walton, Mary Hanlin. 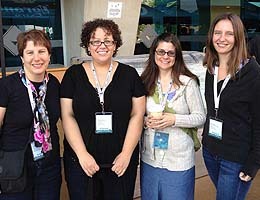 Four librarians, Heather Blicher, Mary Hanlin, Carol Hodges and Dawn Walton, traveled to Guadalajara, Mexico in early winter to attend Feria Internacional del Libro de Guadalajara (FIL), an international book fair. The American Library Association (ALA) calls the event the most important exhibit of Spanish-language books in the world. TCC’s librarians funded the trip with grants from ALA and FIL. The excursion provided a unique learning opportunity. Hanlin said she learned that American publishing and American libraries are not the center of the world. “Having exposure to other countries certainly gives you a different perspective and shows you that we are part of a larger fabric,” she said. 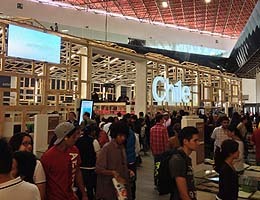 The book fair was housed in an expansive convention center and included sections for different countries and publishers, cultural activities and author presentations. Before heading overseas, the group did its homework and researched the types of books that would aid learning. “We talked to our Spanish professors, early childhood educators, even culinary faculty,” Walton said. Each librarian focused on a specific area, ranging from poetry to non-fiction to graphic novels to art books. “We selected books that support the curriculum, but also would be appealing to any student or community member walking through the library doors. “It is part of our mission to support our Spanish-speaking students, and I know these books will be well used,” Hanlin said. “We believe this trip was an active way to support the college’s global mission,” Blicher noted. The new titles will be on shelves soon in libraries on each campus. They include an illustrated art book, a Bible, an illustrated dictionary, a bilingual cookbook and a children’s book about bullying.